The word is that brown baby bedding is not just for a baby boy’s room anymore judging by the number of requests for brown baby nursery ideas for girls that I've received lately. Baby pink fabric with brown accents as well as chocolate brown bedding with tiny pink accents is now seen in cribs for baby girls. It’s more about the combination of deep, rich tones than the idea that certain colors are gender specific in modern nursery designs. Notice how beautifully the lime green crib bumper, bedskirt and fitted crib sheets blend with the chocolate brown baby bedding with both paisley and polka dot print fabrics. The horizontal green and white stripes of the nursery wall painting technique is a repeat of the design on various pieces of the crib set. Earth tones are enjoying their biggest comeback since the days of the late 1970s and decorators are delighted with the decorating possibilities that come with these luxurious neutrals. We have to wonder why we allowed ourselves to be bullied into decorating with brown on such a limited scale for far too long. These colors were once the territory of rustic, manly décor. Green and brown baby bedding may not have left the enchanted forest look behind, but there are certainly a few more layers and approaches toward using them in a baby’s nursery. Brown baby bedding with forest green still has a masculine flavor to it, but don’t dismiss it as a nursery color scheme for a baby girl. To make it more feminine, you will just need to adjust the shades of green into the brighter lime green or teal family. No matter what accent colors you decide to use with your brown baby bedding, the style of fabric pattern and print will play a larger part in keeping the atmosphere light and suitable for a kid’s room. For instance, the cream or white background in brown toile will brighten the bedding and prevent the dark colors from dragging the décor into darkness. Polka dots, paisley prints and stripes are other fun fabrics that will slip shades of brown into the mix as well as lively accent colors in yellow, pink, green or blue. It’s a fact that that when we are in the process of brainstorming nursery themes that there is a need to restrain ourselves from choosing fabrics and patterns that we might want in our own bedrooms. 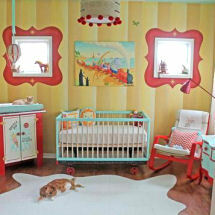 Keep your eyes on the goal of designing a nursery that is stylish but leaves no doubt that the room is for a child. Return to find the latest Brown Baby Nursery Decorating Ideas and tips on how to decorate a baby nursery for boys or girls using chocolate green and brown baby crib bedding sets.